The Land of Stories: The Wishing Spell by debuting author and well-known actor, Chris Colfer, is the entertaining tale of two twins, Alex and Conner Bailey, who fall into a magical storybook and encounter fairytale characters and settings you know and love but with an original twist. It’s mostly aimed at kids from ages 10-12, but as an 18-year-old, I enjoyed it nevertheless. I must admit, as a massive fan of Colfer’s who bought three different formats of the book on the day it was released and was up until 6 AM so I could finish it in less than 24 hours, I am not exactly unbiased. However, as I delved further into the book, I soon had to remind myself that the person who wrote it was, in fact, the same man I spend countless hours freaking out over; I simply lost myself in the story. The characters were captivating, the plot was suspenseful, the lessons were powerful, and it is a book I was incredibly eager to share with the people in my life (including my best friend and my younger sister–who’ve already given it glowing reviews). The book follows the twins as they move through the various territories in the Land of Stories and the items they must find to complete the “wishing spell” and wish their way back home. Among the many things they discover, they encounter princesses, a dapper frog, crying fairies, an Evil Queen with a sad story, and a Goldilocks on the run with some major sword skills. The book moves fast and the plot keeps going, leaving you wondering what will happen next and holding your breath during the obstacles the twins must overcome. As mentioned previously, I began reading and hardly stopped until it was finished. 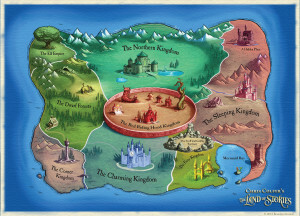 A map of the Land of Stories found on the inside cover of the book. he thought this through left my jaw dropping at some of the bigger surprises toward the end of the story. Everything is connected in some way and the common denominator in much of these connections is love. Love is the primary motive for the majority of the characters and, while the book is certainly not a romance novel (it’s certainly not the point of the book), it does contain romantic elements that incite an emotional response. In addition to adventure and romance, familial love plays a huge part in the dynamic between Alex, Conner, and their parents (one of which is deceased). Perhaps one of the strongest themes of the book is the idea that “villains are just victims whose stories haven’t been told.” At times, I did find that message to be slightly problematic if you applied it to real life (especially if you applied it to my own personal experiences) but then again, it is aimed toward younger people and my ten-year-old self would have adored it. Despite that, I was taken by the emotional depth the characters displayed and the way Colfer handled the heavier themes (particularly loss and love) in a way that was appropriate for children and meaningful for all readers. At times, I was reminded that this is ultimately a children’s book with the simple sentence structures and the repetitive “he said” and “she said,” but Colfer’s writing style still manages to shine, assuring us all that he’s not just an actor attempting to write, but an actor and a writer. I look forward to more works from Chris Colfer the author, especially the upcoming sequel which he’s currently writing and takes place two years into the twins’ future. The Land of Stories: The Wishing Spell is a strong first work from a young author and will hook anyone who’s ready to surrender themselves to the whims of a magical land with fanciful characters that still manage to be so very real and human. This book was amazing! It is so suspenseful and I never wanted to stop reading it but it came to an end. I really recommend reading it if you have not already read it. I love the books of the series they have great plots and twist.Also it is so life like with the details.